12' x 9' (3.66m x 2.74m) Front aspect double-glazed window. Radiator, door to Conservatory. 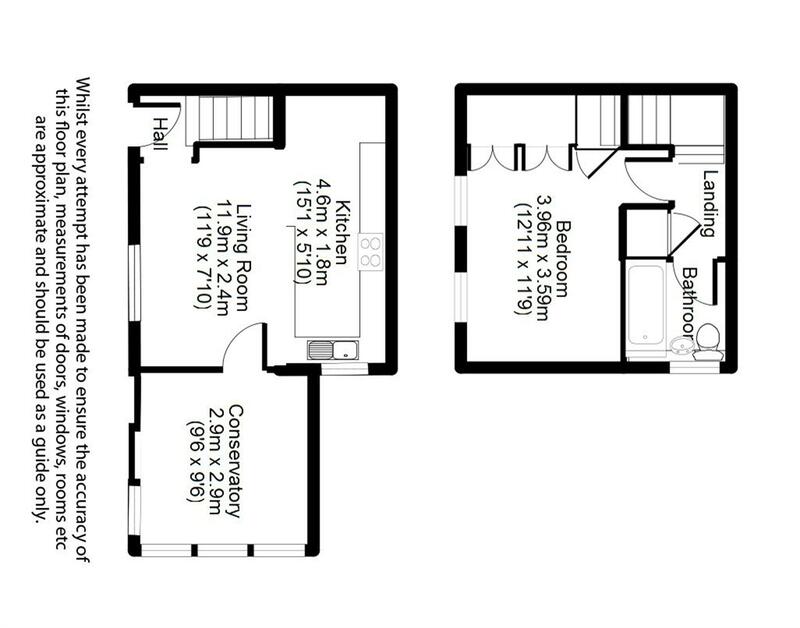 Semi open-planned to Kitchen. 12' x 5' (3.66m x 1.52m) Side aspect double-glazed window. Refitted, comprising of a range of eye and base level units, roll edge work surfacing with inset stainless steel sink & drainer, built-in oven and hob with extractor over, space and plumbing for washing machine and tumble dryer, space for fridge/freezer, under stairs storage cupboard. 10' 2" x 10' 2" (3.10m x 3.10m) Rear aspect double-glazed sliding door to rear garden. Rear and side aspect double-glazed windows, wall lighting, radiator, laminate flooring. Storage cupboard, access hatch to loft (housing boiler), doors to Bedroom and Bathroom. 13' 1" x 7' 10" (3.99m x 2.39m) Two front aspect double-glazed windows. Built-in wardrobes, further over-stairs cupboard, radiator. Side aspect double-glazed window. A white suite comprising of a panel enclosed bath with mixer tap, independent shower over, vanity unit with inset wash basin and storage beneath, low level w.c., radiator, part tiled. The garden comprises of a paved patio with the remainder mainly laid to lawn, timber shed with power, enclosed by brick wall with gated side access to the front of the property. There is a pathway leading to the front door and gated side access to rear garden. There is an allocated parking space with further residents parking.